A video taken from the Francisco Fajardo highway in the La Urbina in Sucre, Miranda Distributor La Urbina in Sucre, a municipality of Miranda, shows evidence of an Unidentified Flying Object (UFO) hovering over a farmhouse in the town of Petare. The video was made by Francisco Lemus, on March 2, 2015 at 09:29 am (HLV) with a smart cell phone while traveling on major highway, linking west to the east of Caracas. In it you can see a dark, elongated object over the mountain. 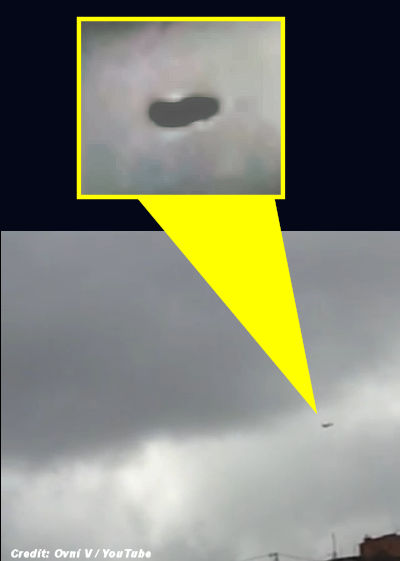 A specialist in aerospace, who asked not to be named, hesitated on the nature of the artifact and noted that the characteristics presented, does not appear to resemble any known aircraft. . . .
Where is the image of him going away?